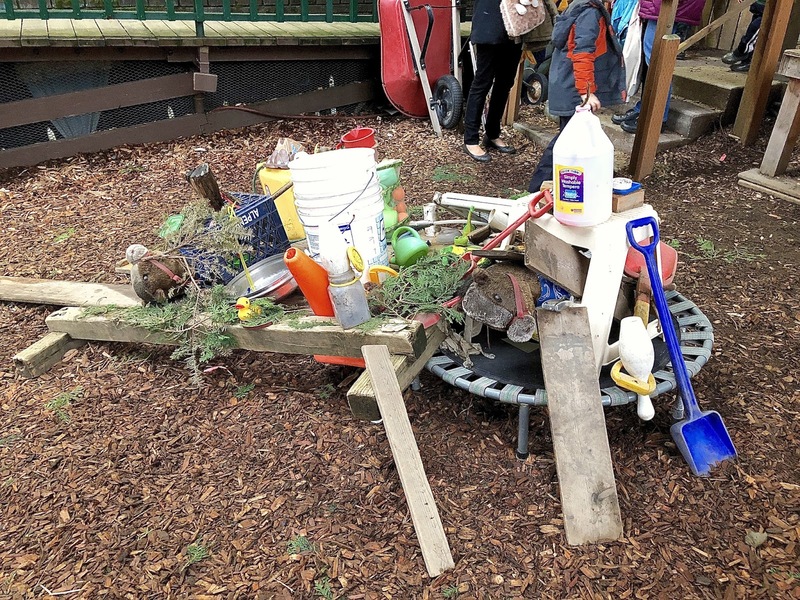 A couple months ago, I wrote about our "bad guy trap," a work of playground folk art created mostly by a couple friends that grew from the debris (what others might call "loose parts") amongst the lilacs at the top of the concrete slide. That's mostly gone now, although there are still a few buckets dangling from branches up there. 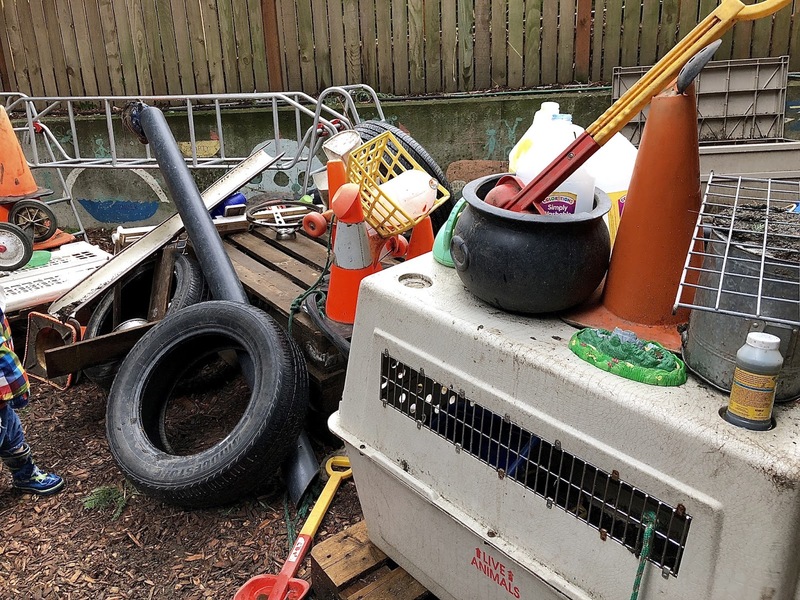 The good news, or bad new depending on your perspective, is that it appears to have just outgrown it's former location, moving to a slightly more spacious area between the cast iron water pump and the swing set. I hadn't noticed it happening at first, this migration, although it began several weeks ago when some entirely different children managed to get one heavy shipping pallet stacked atop another. They had then arranged four tires in the appropriate positions, installed seats made from milk crates, used an old baby gate as a front grill, to create a car complete with a steering wheel. The car had been a hit for a day or two, with lots of kids of all ages taking their turns sitting there, pretending to drive various places, but had been more or less abandoned since then. 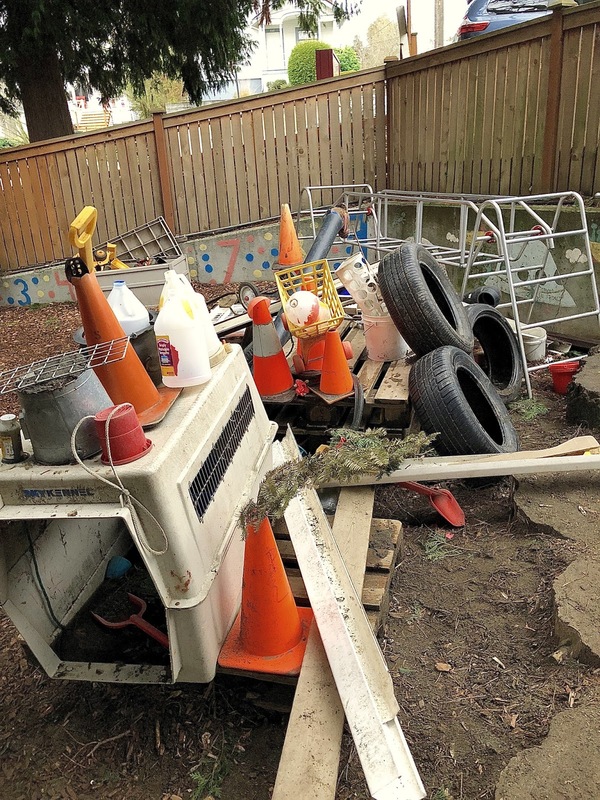 Our bad guy trap builders had, slowly at first, claimed it's rusty carcass for their own, one loose part at a time, until one day in sort of final flurry it emerged as a full-fledged trap. It's now been an established part of the playground for a couple weeks, although it's still an ongoing project with the two builders forever tweaking it. Like before, the trap's creators have been relatively generous, not objecting to other children playing on and around the it, although they sometimes issue urgent warnings about the dangers of their device, which has served to cause most of the kids to treat it with a kind of respect. Occasionally, we've pulled items from their structure for other uses -- for instance, some of the kids wanted to saw branches off the old Christmas tree that had at one point been incorporated -- and the guys have only mildly objected before using it as an opportunity to make further improvements. We seem to have a child or two, usually boys, with this sort of building instinct every year. It can be both annoying and challenging as they lay hands on everything that's not nailed down for their projects, heaping more and more onto their pile. In prior years, these kinds of builds have filled the sandpit boat on more than one occasion. Last year, they managed to stuff the lower level of the playhouse from floor to ceiling. More often than not these projects can only be left standing for a day or two because the other children start to object to the commandeering of their favorite spaces and objects, but these guys have shown a particular genius for picking relatively out-of-the-way locations so we've been able to let it ride for longer than normal. 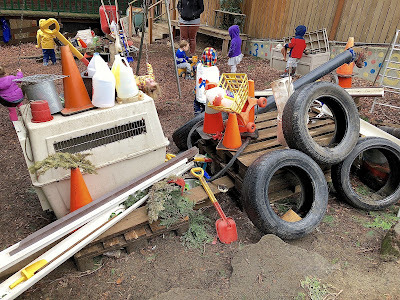 My rule of thumb for these things is that if it appears to have been abandoned for more than a couple days, we dismantle it by way of sort of "re-setting" the scene and freeing the debris (loose parts) to once more do their thing. On Monday, a new structure began to emerge, a "spider's house," the brainchild of another boy who had not previously shown a strong interest in constructive play. Indeed, most of his school year has been characterized by social challenges as his long time "best friend" has sought to expand his social horizons, which has hit the kid as a kind of break-up. After weeks of more or less chasing his best friend around the playground, not being rejected, but no longer being treated as the favorite, he seems to have finally found something else to do. 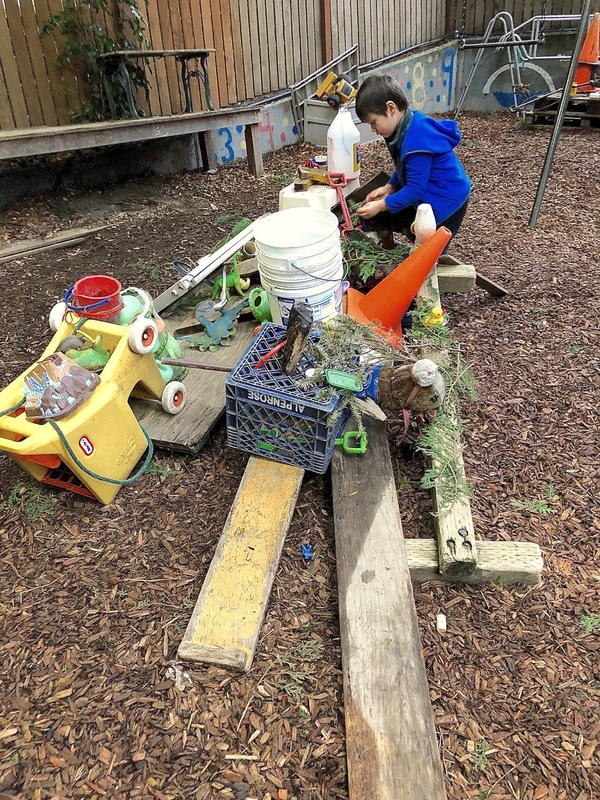 His mother told me that constructive play has long been his go-to play-alone activity at home, but other than a few smaller creations, this is the first time it has emerged at school. I like to think that he has been inspired by the bad guy trappers, but whatever the case, he was fully engaged for 45 minutes or so, telling anyone who would listen the story of his spider's house. I'm sort of rooting for our bad guy trap builders to begin collaborating with our spider's house builder, but that's up to them, not me. At some point, be it days, weeks, or months, these constructions will be gone, scattered about the place only to be recollected into something else. This is the beauty of this sort of play, the kind where children are free move and manipulate their surroundings as their needs and imaginations dictate.